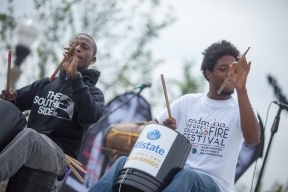 FM Supreme performs her new song “Still Believe” as part of the 2015 Great Chicago Fire Festival, which kicked off interactive programming for more than 50,000 Chicago youth this summer. The Bucket Boys perform during the 2015 Great Chicago Fire Festival kickoff in La Villita Park. Redmoon was joined by the Chicago Park District to kick off the Great Chicago Fire Festival at La Villita Park with three hundred Chicago Park District day campers taking part in interactive arts programming and performances by Chicago-based artists. Jim Lasko, Executive Artistic Director at Redmoon, speaks to hundreds of Chicago Park District campers to kick off the 2015 Great Chicago Fire Festival in La Villita Park. “We are excited to officially kick off the Great Chicago Fire Festival by bringing Chicago’s youth together with interactive programming in our parks. 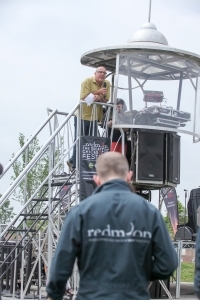 The Festival is a summer long celebration of collaborations and talent from Chicago’s neighborhoods,” said Jim Lasko, Executive Artistic Director, Redmoon. “This is just the start of reaching 50,000 Chicago youth over the summer. Redmoon will be working with Chicago Park District day camps, After School Matters, Boys & Girls Clubs of Chicago, Allstate, and community-based organizations to reach 50,000 Chicago youth over the summer through the GRIT activity (Group Ritual Imagining Tool). Redmoon will also support in-depth youth residencies and free programming in seven parks throughout the city, including locations in: Calumet Park (Eastside), Homan Square (North Lawndale), Humboldt Park (Humboldt Park), Loyola Park (Rogers Park), Margate Park (Uptown), Piotrowski (Little Village) and West Pullman Park (West Pullman). “We are excited to welcome Chicago Park District day campers to La Villita Park to participate in the 2015 Great Chicago Fire Festival,” said Chicago Park District Superintendent and CEO Michael P. Kelly.” The Great Chicago Fire Festival is produced by Redmoon in partnership with the Chicago Park District, City of Chicago, and presented by The Allstate Insurance Company and the Pritzker Foundation. 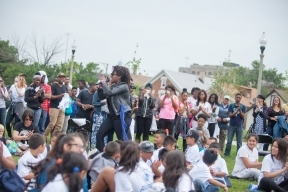 A Chicago Park District camper (from Piotrowski Park) participates in a Spoken Word workshop (with Maya Barros Odim) as part of the 2015 Great Chicago Fire Festival, which kicked off interactive programming for more than 50,000 Chicago youth this summer. 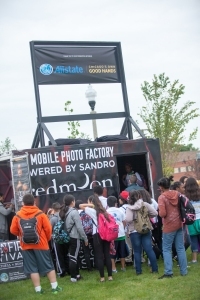 Attendees at the Great Chicago Fire Festival kick off took part in interactive art workshops, including the mobile photo factory in La Villita Park.